We don't need to empower our child Within to trust their nature.Our child's not wounded we are, The tendency to trust is there. We simply need to re-allow them to do so. We never do anything to our child within that will make us feel badly about ourself. This we have learnt from childhood we do this all the time. We do it with words both internal and external. We take on a parental voice and we do it with looks. There are two ways we treat our child within. One is the punishing/blaming: "You are very bad, go stand in the corner or I'll spank you." The other is permissive: "That's perfectly all right darling, if you want to walk on mothers face she doesn't mind." We don't know any other way. The more correct way is what we call information. If we thoroughly understand that our child within are innately social, then we understand that what they want is truthful information. We don't have to be angry to tell them what's needed. We just let them know. The idea is not to blame, and not to praise, because both are insulting. Expect child within to do the right thing. We then are being a clear model and there's no conflict. It's the way nature designed us to behave and slowly we re-connect. The Ten Stages is a studied recovery course. It is a source of reconnection a method of unlearning and a reintroduction to our child within which leads us back to our one true intuitive voice.We start to learn and come out of our protective dysfunctional shell and reclaim our lives. Every 30 Years or So in Recovery We Experience These Gigantic Steps Forward. and the Ten Stages May Well Be It.. . The Ten Stages by dis-engaging from identification with the stream of thought objects, a space is created for awareness of the intuitive voice to shine forth unobstructed. The basis of recovery in ten stages is understanding, not blame, guilt or shame. 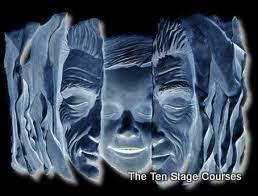 Their is nothing remotely like THE TEN STAGES. The Ten Stages are the way through to the child within.